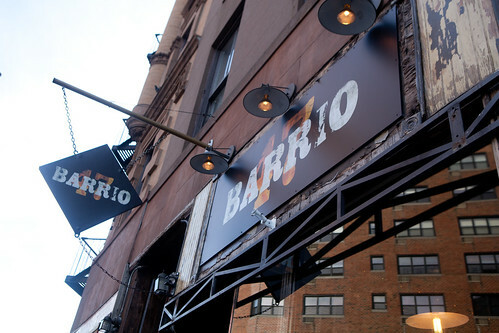 Last Wednesday, I had dinner with a friend at Barrio 47. 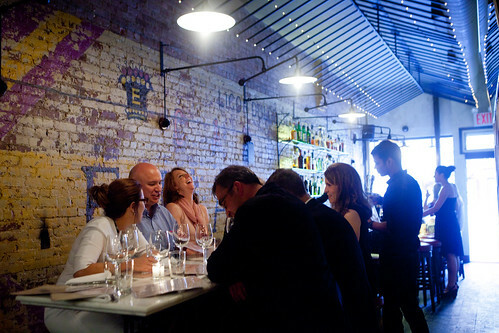 It’s a narrow, handsome Mediterranean, neighborhood type of restaurant located in West Village, with the kitchen headed by Executive Chef Miguel Rosado. We arrived during the early dinner hours, where there the marble bar and the communal table at the front of the restaurant was filled with (generally) young patrons enjoying their Happy Hour drinks, as dinner has not started yet. 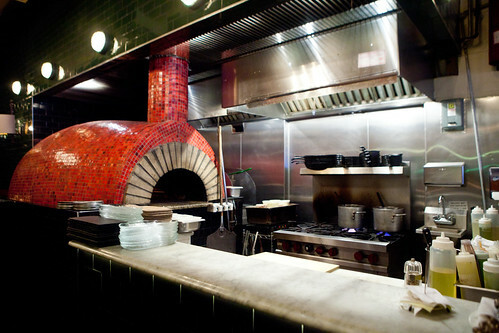 As soon as dinner service kicked in, we sat near the back with a direct view of the open kitchen and its beautiful red mosaic wood-fire oven just a few feet away. 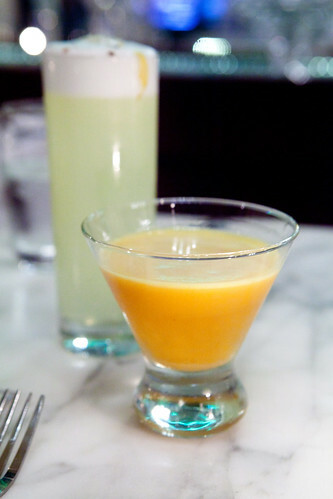 We started with cocktails of the sweet-tart daiquiri Barrio Especial made of passion fruit puree, Mount Gay rum infused with lemongrass and vanilla and the pineapple-y, slightly sweeter Guapo Fizz with a lovely creamy egg white cap. 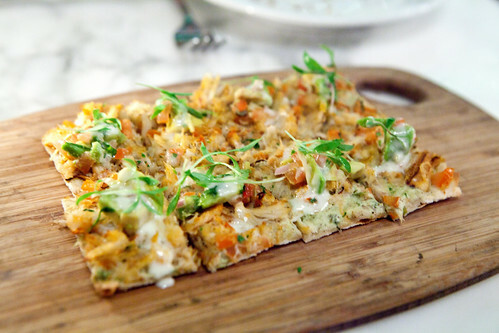 Along with the drinks, we dug in the delicious Dungeness crab cocas, a Spanish-style flatbread that’s baked in the wood-fired oven topped with flakes of sweet crab meat, dotted with fine cubes of creamy avocado and lightly sauced with crème fraîche. 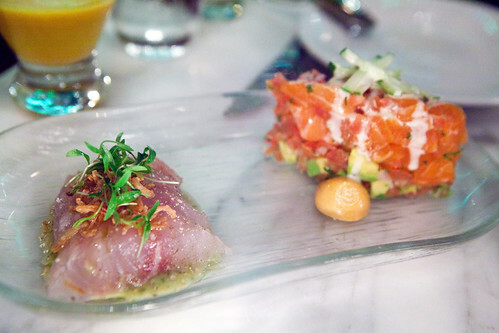 The crudo duo ($13) of black bass crudo with tomatillo and the salmon tartare with diced avocado and slivers of crunchy cucumber were simply luxurious. Silky, sweet, sashimi-grade fish with minimalist touches make for a very good appetizer. 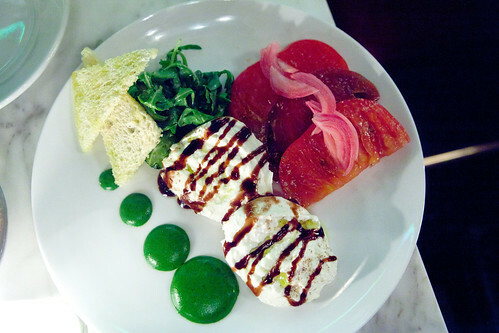 The Barrio salad was very seasonal and a welcoming dish for me. The bitter escarole, creamy burrata cheese drizzled in balsamic vinegar and the super sweet heirloom tomatoes all screamed summer to me in a very great way. If I had to pick a dish that I’m completely enamored with of that entire meal, that would be the Portuguese octopus ($15). The tender, meaty tentacles that’s intensely spiced and seasoned from the chermoula marinade that it tastes great even without the garlic confit aioli. 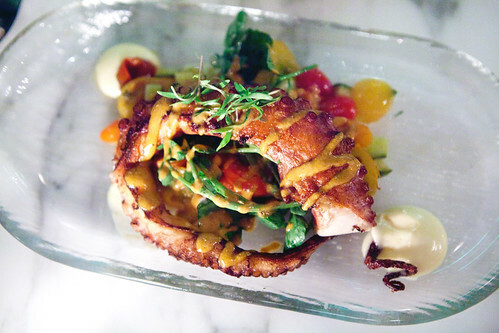 The baby heirloom tomatoes did emphasize the inherent sweetness of the octopus. 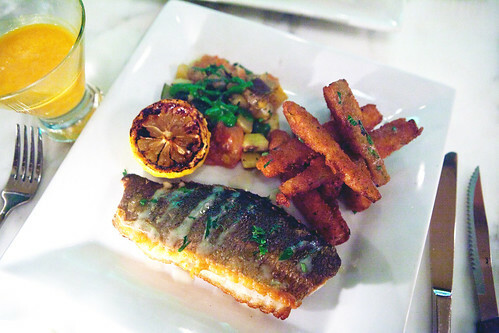 The perfectly seared branzino ($26) with sides of crispy zucchini and corn ratatouille was very good. The ribeye a la Parilla ($26) served with a hefty portion of herbs de Provence potato gratin and a salad of watercress, fresh shaved figs comes as a relative mixed reaction. The ribeye steak was cooked to a beautiful rosy, medium-rare pink and it’s seasoned well but I did not care for the potato gratin, as it’s too heavy for the summer. 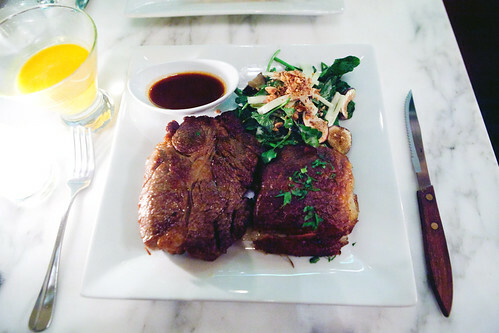 The fig and watercress salad was the perfect, refreshing accompaniment to the steak. 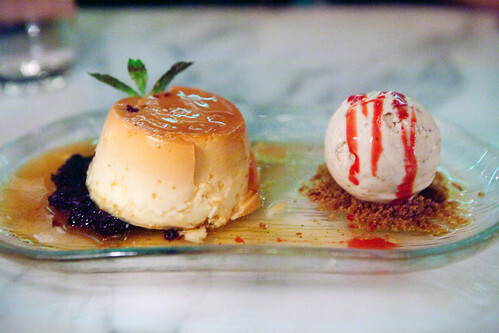 To end the meal, we had flan ($10) with a scoop of Turkish fig ice cream and dried fruit compote ($10). Dessert was the weakest part of the meal. Unfortunately, the flan was a bit overcooked that it’s a firm custard instead of it being the wobbly, creamy Spanish dessert that I know and love. The saving grace was the delicious fig ice cream. We were brought out digestif cocktails, concocted of lime juice, vodka and cassis liqueur. 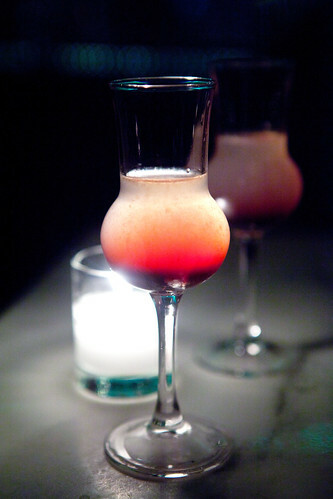 A bracingly tart drink that’s pleasant to have after a very filling meal like this. In all, I highly recommend this restaurant for the strong, well made cocktails and the savory courses (especially the Portuguese octopus or any fish/seafood dishes, in general).